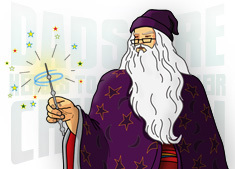 Perhaps you should wear gloves to make your Golden Snitch. 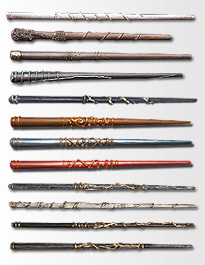 After all it is usual for the snitch maker to do so, so that he or she does not touch the ball during manufacture. 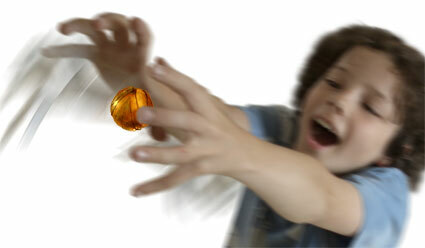 The snitch remembers who first touched it. 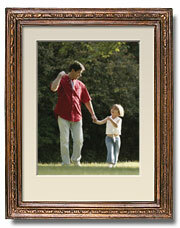 In most cases this is the seeker who catches it, and it would do to have it confused by the touch of its maker. 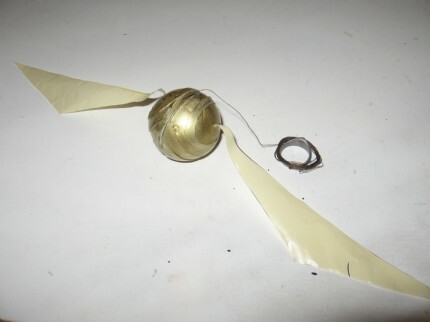 This snitch is very easy to make. 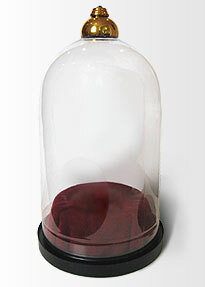 It's made from two table tennis balls glued round each other and spray or painted with gold paint. I have tried three different types of gold finish: Brilliant Metallic spray (the best), gold marker pen (not bad) and regular gold spray paint (too dull for me). I didn’t try gold leaf, but I imagine that that would look amazing. 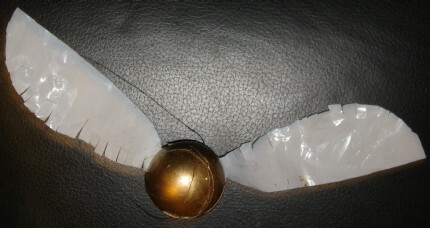 If you want you can distress your finished snitch a slightly by painting some black acrylic paint on to the finished (and completely dry) snitch and the wiping it off so that the black stays in the cracks and corners. 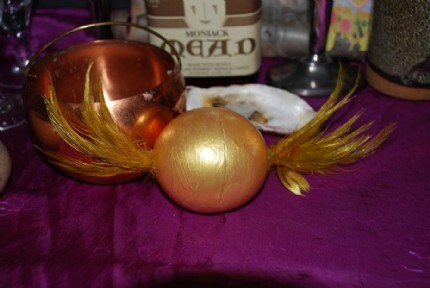 For me I think that the brand new shiny snitch looks better… I mean, doesn’t it look so cool. 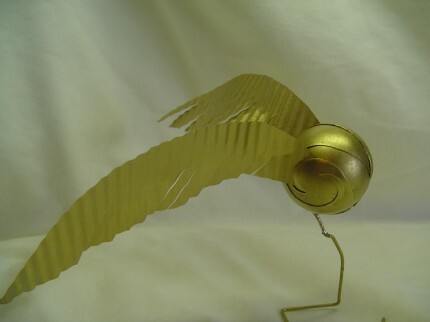 Your full, How-to-Make a Golden Snitch instructions are available in both A4 and US Letter format PDFs and can be easily downloaded by just clicking on size you want to download. 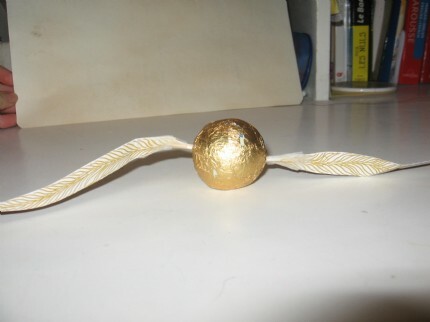 Posted by yoyomax12 - My Golden Snitch. 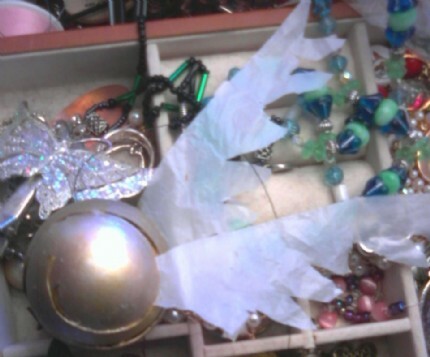 I used paper wings crimped and painted gold. 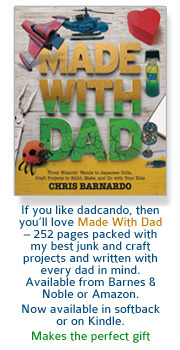 Posted by tristanzdad - Our second Dadcando project. 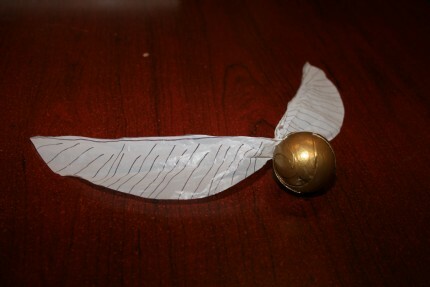 My son loves his Snitch! Posted by onegirl - I didn't follow your process exactly, but was inspired by it. 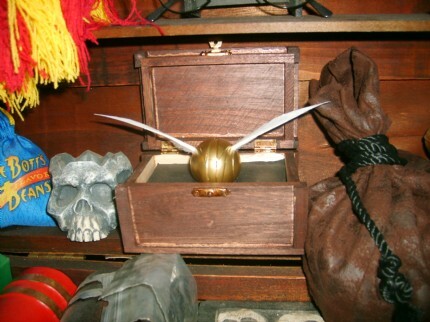 The snitch had to open up - it contained the "clue" poem that the kids would need to start them off on a hunt for their spellbooks. Posted by Escere - I forgot to do the reverse image part... but that's ok.
Posted by juliet - This is my second snitch model, made according to your instructions. 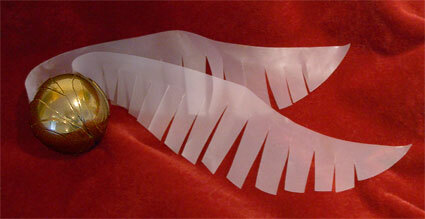 Posted by mustang2044 - For the Wings i used craft feathers and trimed them to the right shape.